Without effectively replacing the relatively lucrative poppy farming industry in Afghanistan with other ways and means of income for the Afghans, the destructions of the fields will simply not break the vicious nexus of war and drugs. Afghanistan remains the largest producer of raw poppy, which is not only fuelling the insurgency but also damaging the fabric of the Afghan society and its economy. A stroll down the western Pul-e-Sokhta neighbourhood in the capital city Kabul reveals a bleak image of the rapidly growing number of addicts, mostly young men. Under the World Bank economist-turned-politician, President Mohamad Ashraf Ghani, the Afghan government has acknowledged on multiple occasion the fact that without a fight against this criminal economy, peace and stability would be difficult to ensure. This needs to be followed with serious decisions and measures to target the sources of narcotics processing as well as creating alternative an economy for the farmers – particularly in areas where the rebels have significant clout. According to statistics provided by the Afghan Ministry of Counter-Narcotics and the UN Office on Drugs and Crime (UNODC), the poppy cultivation in Afghanistan has increased by 87 percent. 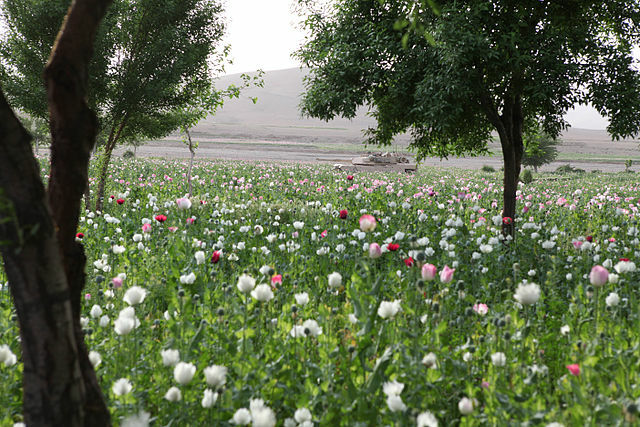 Helmand is the country’s major opium poppy cultivating province, followed by Kandahar, Badghis, and Faryab provinces. Most significantly, access to sufficient irrigation water is crucial in enabling farmers to take up alternative crops. For this, the Kabul government needs to prioritise the construction of small and medium dams across the country. With the change in climate taking its toll, winters are getting drier each year, resulting in scarcity of water in summers. Thus the management of water in the most efficient way possible is a key factor in securing the transition and development of alternative crops. Furthermore, in terms of breaking this deadly nexus, tight control over the borders as well as other transit routes of the raw and processed poppy can help change the course. Yet one of the biggest challenges to overcome, should this transition take place, is to expose individuals and groups on the government side who are deeply involved in the farming, processing and trafficking of narcotics. Ideally, actions against this menace should start by bringing the house in order. As members of the Central American migrant caravan continue to flock to the U.S. border, Trump Administration officials do all in their power to stop them. Can Africa break free from fossil fuels? African citizens and communities pressure their governments to break away from fossil fuels and embrace renewable energy. Two and a half months following inconclusive elections and intense negotiations, a coalition government rules Italy.